Pastoral care from the parish priest can be a challenge. On a Sunday morning visits are fleeting as the clergy dash from village to village. As some people always worship in their village, some travel to a preferred form of worship and some vary their worship as they wish it is not unusual for a minister not to see ‘regulars’ for months. At the same time many in the churches are recognising the strength of coming together as benefice, supporting one another in prayer, worship, mission and finance. In the past small groups, even seasonal study groups, had struggled. Typically people managed three or four sessions out of a six week course. Committing to a pattern of prayer that fits and shapes our living. Following the seasons of the church and of life. Meeting together when we are able. The pattern of prayer shared was a simple one. The services of morning and evening prayer provided in the Prayer Book are intended for all, not just those in ministry, yet morning and evening are difficult times for many. So Steps offered a simple shape of prayer based on the mid-day office and compline, leaving freedom to follow whichever pattern fitted and shaped peoples lives. This pattern was seen in a wider context too in the celebration of saints and seasons. When Steps met this pattern shaped the meeting. 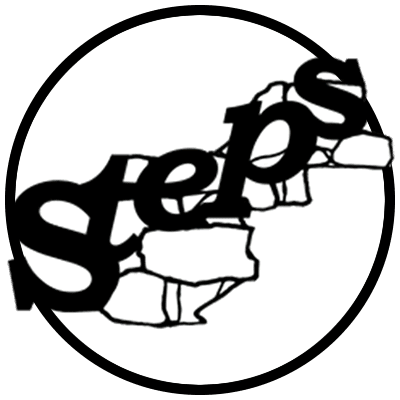 Steps did not meet to discuss parish share or hot-topic theology, but to be open and honest about spirituality, something Anglicans frequently need to feel permission to do. In Steps people shared their experiences of Christ’s presence in Holy Communion, explored how God spoke in different ways and considered the nature of vocation as one of the community left for the religious life. Learning together what it means to be visible Christians in our communities and our social networks. “We never see the Vicar”, true or false is a frustration in many smaller villages. Increasingly Church members fulfil more of this role, but Steps recognises this as a shared responsibility. A growing confidence was found in being open about faith. One member of the community organised s a ‘faith and art’ group in their village as well as a monthly farmers market, but for other members it was a simple step of being honest to neighbours and friends that they are Christians or a ‘Church Person’. Sometimes clergy need to learn to be visible, even if it is strategic attendance at events! Growing in faith with one another and journeying together, both physically and spiritually. Some Steps members had been Christians a long time, others were newer or returners to faith. Reflecting on Hebrews 5 barriers crumbled as people realised that weaknesses enabled shared priestly ministry, that wherever we people think they are on their journey there is something they can offer. There was even discomfort as the implications sunk in regarding ordained ministry. Pilgrimage together is about spiritual pilgrimage but physical journeys can be part of this. Many found themselves travelling, not just to monthly gatherings, but on a Sunday morning, be it for an 8.30 Prayer Book Holy Communion, or to play the organ at different services. This wasn’t just tolerated as a frustrating aspect of contemporary rural church, but engaged with as spiritual service. Responses to different places of worship were shared, highs and lows. The group journeyed on actual pilgrimage together visiting a holy well. The three-fold rule adopted was not an accident, it was a response to the particular challenges of being a rural Christian in North Oxfordshire. Others considering a similar community would need to reflect on their context and a suitable rule, although I suspect there is considerable overlap. As a parish priest Steps was not only a place of giving but of receiving. Although my role as minister of word and sacrament was recognised, the responsibility for prayer and planning was shared, especially with our Lay Warden. We practiced hospitality and welcomed the occasional as well as the regular, especially those involved in lay ministry who recognised that Steps meeting were a place to come for support and encouragement. We held each other and the benefice in prayer even when we were not together.